Flight controllers monitoring the International Space Station’s atmosphere detected a steady but small drop in pressure on Aug. 29. At the time, the six astronauts onboard were sleeping. Controllers didn’t wake them up right away—the station wouldn’t have run out of air for 18 days. Once awake, the astronauts discovered a 2-millimeter hole inside the Soyuz spacecraft, which ferried the most recent expedition some 250 miles (402 km) up to the station in June. (Naturally, the hole was behind the toilet.) At first, the cause was assumed to be a micrometeoroid or other space debris, the bane of human spaceflight in low-earth orbit. But the breach appears to have been caused by the errant drill of a Russian manufacturing technician, which skittered across the surface of the spacecraft. These types of quality control problems with the Soyuz—the only way for astronauts to get to ISS—will pile more pressure on the delayed efforts of Boeing and SpaceX to fly astronauts for NASA. Instead of reporting the problem—which could have required a costly and time-consuming re-build—the technician apparently covered the hole with a patch, which ultimately gave way. Cosmonaut Sergey Prokopyev was able to re-patch the hole with gauze and epoxy, an effective temporary solution. Luckily, the breach is located in a section of the spacecraft that is jettisoned before it returns to earth—had it been in the segment where astronauts sit, the situation would be much more serious. “Despite the incredible capability and robust designs, Russian space technology production always suffered from quality problems,” Mark Albrecht, a longtime U.S. government space policymaker and former executive of a Lockheed Martin partnership, told me in 2017. That was during a discussion of the Proton rocket, built by a different company; the Soyuz has a longstanding record of reliability, with no failures in 90 flights since 1983. An investigation into the Soyuz hole will include a careful examination of the assembly of that spacecraft to ensure it can still carry astronauts down in October, as well as the spacecraft launching a new crew of two Russians and one American shortly thereafter. If problems are suspected with either spacecraft, it may force some or all of the ISS crew to return to earth prematurely, because the station must maintain a reliable “lifeboat” for all six of its passengers. Even without errant drill holes, astronauts are facing challenges getting to orbit. In July, government auditors warned that SpaceX and Boeing were in danger of running out of time before a Soyuz flight scheduled for November 2019, the last with Americans onboard. NASA executives managed to push that flight to January 2020, and are also considering using test flights of the new vehicles in 2019 to carry additional astronauts to the station for long-term missions. But if delays continue to mount, it could leave the U.S. locked out of the station for months. 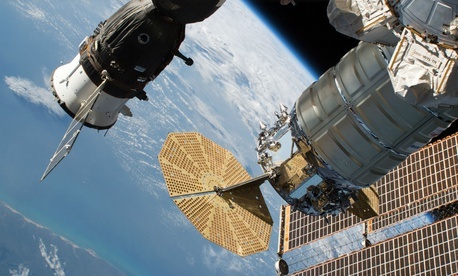 NASA officials told the auditors that the ISS can’t function without astronauts onboard. That’s largely because the $150 billion station’s function is to keep humans alive so they can perform research projects. Kevin Metrocavage, a NASA operations manager for the ISS, describes the station as both a complex vehicle like an airplane, and a home. The real problem with an empty or under-crewed station isn’t that it might fall out of the sky, but that it would be a colossal waste. As it is, ISS astronauts are heavily scheduled, acting as lab technicians for research projects (which often include themselves), exercising to maintain their health, fixing and maintaining the station, installing new hardware, and squeezing in sleep and personal time when they can. The vehicles being designed by SpaceX and Boeing are extremely welcome at NASA in part because they promise the ability to keep four U.S. astronauts on station at a time instead of just three, expanding the amount of work that can be done on station.